Quality and consistency are important to us at Propelair. As well as quick after sales support and an in-depth knowledge of industry requirements, we pride ourselves on being able to offer downloadable content, ‘how to guides’ and product information quickly and easily. 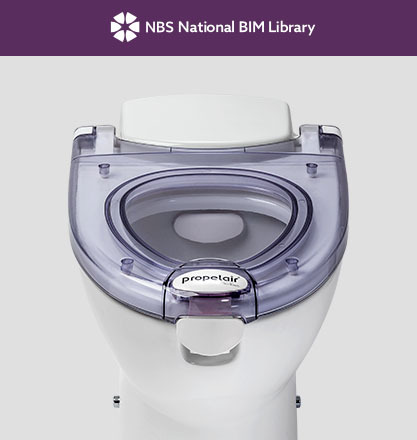 To find more information about our ground-breaking toilet, click the links below to download our E-Brochure, specification sheet and BIM Object. To stay in touch and continue receiving our latest news and information, sign up to our mailing list. 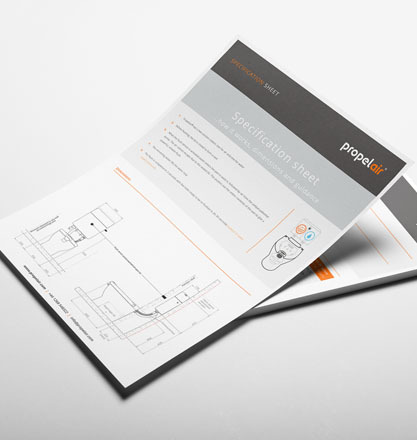 Find out all the information you need on the Propelair efficient toilet including product details, case studies and how it is the optimal toilet solution for your business. Our product information is now available within the NBS Plus library of product clauses offered in NBS specification products. The clause can be copied and pasted into your product specification document. Our BIM object is now available to download from the National BIM Library. To view the files, you will need Revit building information modelling software by Autodesk. BIM files are quite large and may take a few minutes to download. Can a soft close lid be used? The lid must be shut properly for the toilet to work. There is no soft-close option currently, but we are working on developing a new lid and seat along these lines. Can a sensor flush be used? Yes, we offer a flush sensor currently. Is the toilet designed for the domestic market? The current design has a concealed cistern, so is aimed solely at commercial users. The close-coupled version will be designed for the domestic market. Is the toilet available in wall hung and closed coupled versions? No, these are currently in development and will be available in 2020. British Standards state you must install a six-litre toilet, is this correct? No, according to BS EN 997, the volume for a full flush is to be defined by the manufacturer. How long does it take to refill the cistern? With normal water pressures, the toilet will be ready to flush again in 30 seconds. In some pressure situations (e.g. below 1 bar) it will take longer. What certificates does the product hold? The product has been tested to WRAS and BSI Kitemark standards. In addition we have Watermark certification and are currently undergoing Agrément approval. The Propelair toilet is also on the ECA Water Technology List making it eligible for enhanced capital allowances. Is 1.5 litres enough water to flush a toilet? Yes, we have done years of testing at different flush volumes, and have proved that this is enough water to flush a toilet. How long is it guaranteed for? We offer a 12 month warrantee, based on normal usage conditions. Please note that damage due to power losses, serious drain blockages, and physical abuse do not fall into ‘normal usage conditions’. Is it powerful enough to clean the bowl? Yes it is. The first part of a flush is the pressurised water spray, specifically to clean the bowl. This passes the WRAS standard ‘sawdust test’ easily. Do I need to maintain my Propelair toilet in any specific way? 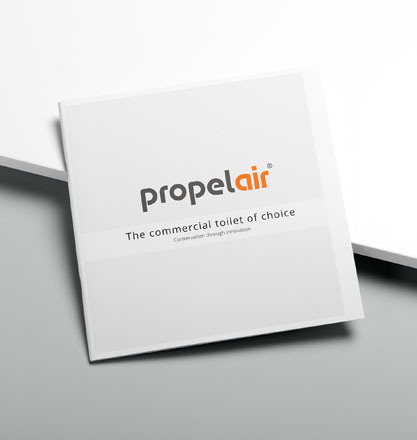 The Propelair toilet has been designed to be easy to maintain. The toilet is rimless, which aids cleaning. The seat design is particularly robust. The seals do need cleaning with soap and water regularly. Is there a pan connector available? Yes – we use standard fittings – in this case a McAlpine DC3BL. Can anyone install the product? No, only trained installers are permitted to install the product. Do contact us if you would like to be put in contact with a local, approved installer. Please note that if the toilet is installed by anyone else, this will void the warranty. As the Propelair toilet uses electricity does this mean installation is more technical? The Propelair toilet is a little more technical than a conventional toilet. The system uses a 24V control module, an air pump, and a water pump, in order to achieve the required water savings. Propelair provides a half day training course for installers, and maintains a list of approved and trained installers. Yes – there are two. Firstly, water flows through the system into the pan, so you can see when there is a problem. There is also a secondary overflow, which copes with a much higher volume of water, if required, which is then emptied directly into the drain. Are drainage tests industry proven? The Propelair toilet has been tested to WRAS and British Standards, covering the functionality of the toilet. Furthermore, through working with testing houses and universities, has evidence that drainage in unaffected by the installation of Propelair toilets. What drainage system can be used? The Propelair toilet is designed to work with standard 110mm (4 inch) pipework, which is the standard size for drainage. What do I need to do if the toilet gets blocked? If the toilet gets blocked, act as you would for a normal toilet. You can use conventional plungers or rods to clear blockages as you can in conventional toilets. If the main drain is blocked, speak to your normal drainage contractor. Will drains block on just 1.5 litres? No, they do not block on just 1.5 litres. We have done extensive tests with universities and independent, accredited testing organisations which show that 1.5 litres is a minimum suitable flush volume. We have sites where over 100 toilets are installed, with no negative consequences for the drains. How many times will the battery option flush without power? It will be able to flush between 50 and 100 times. However, it should not be flushed more than 25 times, to protect the batteries from going flat. What happens when you have a power cut? The toilet will continue to flush if you have a power cut. The old-style PCBs will allow the toilet to continue to flush until the batteries are drained to the extent that the toilet will not flush anymore. The new PCB (from April 2019) will protect the batteries by stopping flushing after 25 flushes. It is important that the batteries are not allowed to go flat. If they go flat, they must be recharged within 24 hours. In the case of a power cut, it is also possible to empty the pan by pouring a bucket of water into the pan. The batteries are tested to 200,000 flushes. At 100 flushes per day – this equates to 2,000 days or 5½ years. Yes. The Propelair toilet uses electricity at 24V to power a control module, an air pump and a water pump. It was rigorously tested by the British Standards Institute for safety, before they awarded the Kitemark to the product. Does the need for electricity increase the cost of use? At current electricity prices, one thousand flushes costs between 3 and 4 pence in electricity charges. This would be offset by the saving in water of around £7.50.